Hola! My name is Yane Marquez and I was born and raised in Cuba. After graduating from the University of Havana and the Tourism School of Cuba, I worked for over 10 years as a tour guide, translator and event organizer for Cuba's travel companies and organizations. I guided many groups attending Cuba's main international festivals, fairs and events. A few years ago, I moved to Canada where I have continued promoting Cuba’s tourism industry. I would be more than happy to answer any question you have about festival Cuba travel. Do not miss out! Accredited schools and universities will no longer need to apply for a Specific License for Cuba travel by their students, faculty and staff (including but not limited to adjunct faculty and part-time staff). Now they can travel to Cuba under a General License (no application necessary) if participating in a structured educational program as part of a course offered for credit by the sponsoring U.S. institution. Subscribe for email updates from Authentic Cuba Travel. Our monthly Newsletters are full of great information for architects, landscape designers, urban planners, architecture professors and architecture related professionals, summarized in a quick-read format. Last minute discounts on Cuba architecture tours, contests and Cuba study travel opportunities, all to keep you up to date with the world of Authentic Cuba Travel. Sign up to win a FREE Cuba Architecture Trip! Cuba has some of biggest and better conserved Spanish colonial architecture cores in America. No wonder, Cuba’s Architecture is one of the most significant attractions for foreign visitors to the largest island in the Caribbean. Today, they still preserve part of their charming and dignified antiquity as we will witness during your Architecture Cuba tour. Architecture Cuba Travel for Architecture Professionals, Architecture Professors, Faculty and Students and all those interested in Cuba’s Architectural Heritage and Historical Preservation. Authentic Cuba Travel in coordination with the faculty of architecture of the University of Havana, the faculty of architecture of the University of Santiago de Cuba, the support of Cuba’s architecture conservation organizations and Cuban architects warmly invite architects, urban planners, landscape designers, architecture professors and other architecture related professionals from Canada, US and all over the world to join this Cuba architecture tour taking place from August 15 to August 26, 2020. This architecture and cultural tour travels to the biggest and better conserved Spanish colonial architecture cores in America, from Havana city to Santiago de Cuba. You will embark on guided tours of all UNESCO Heritage sites in Cuba fully escorted by the hand of renowned Cuban architects and architecture conservationists. Authentic Cuba Travel warmly invites invites architects, urban planners, landscape designers, architecture professors and all those interested in Cuba’s architectural heritage and historical preservation from US, Canada and all over the world to join this Cuba architecture tour taking place from August 15 to August 26, 2020. This Cuba study tour is also a brilliant way of seeing the real Cuba; such a passionate and patriotic people have transformed this country into a very environmentally friendly place (Cuba is one of the few self sustainable countries in the world); partly because of the trade embargo, meaning that nearly everything the Cuban population uses is made and produced in Cuba and as a result is sustainable. Cuba is also one of the world's last bastions of communism with a fascinating modern history. Cuba's relative political isolation has prevented it from being overrun by tourists, and locals are sincerely friendly to those who do venture in. This architecture Cuba study tour represents a great opportunity for architects, urban planners, landscape designers, architecture professors and other architecture related professionals keen on architecture heritage to witness the profound influence of Spanish culture on the social fabric of our Americas. Please, check the day-by-day itinerary below. 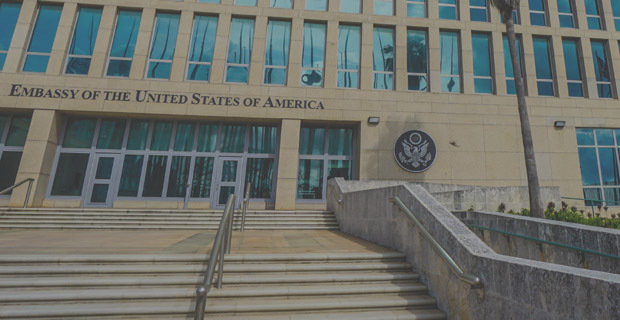 In January 2016, the US Government announced further enhancements to the 12 categories of authorized travel to Cuba that previously required a specific license (this is, lengthy applications to OFAC). Now travel to the Caribbean island is allowed under a general license (this is, self-completed paperwork with no application to OFAC needed). After President Trump’s policy change on USA Cuba travel on November 9, 2017, the General License for Educational Activities remains in place. Accredited U.S. graduate or under graduate degree-granting institutions; U.S. Academic Institutions; and U.S. Schools can organize and sponsor an educational trip to Cuba for their students, faculty and staff under the General License for Educational Activities, provided that the trip meets OFAC guidelines; and that an employee or other representative of the organization escorts the trip to make sure such guidelines are followed by all participants. We take care of all details both in North America and in Cuba, including VISA and flight arrangements to Cuba's main destinations via USA ports (Miami, Tampa, New York, Los Angeles, or other) or through third countries like Canada and Mexico. 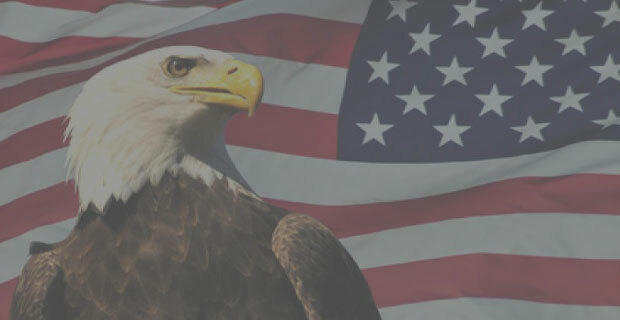 Authorized US organizations can travel through a third country subject to the same restrictions and requirements as those flying directly from USA. 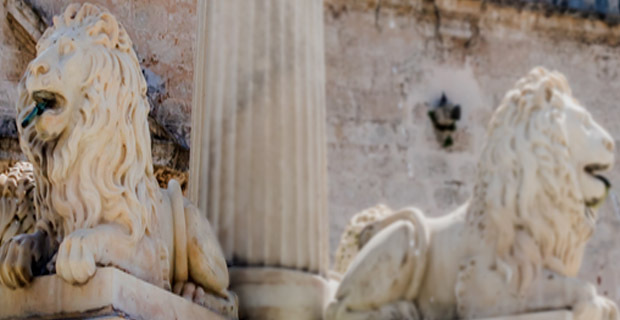 At Authentic Cuba Travel, we have been organizing such educational and cultural travel experiences from the United States of America for years with great success. Request Your Complimentary Custom School Tour & Quote Now! Historic Preservation Organizations, Heritage Foundations, Architectural Heritage Associations, and other Organizations from USA can organize and sponsor a trip to Cuba for educational exchanges not involving academic study to promote people to people contact for their members and the general public. Certain conditions are to be met to comply with OFAC General License requirements for USA Cuba travel though. The trip should consist of a full-time schedule of activities intended to promote the exchange with the ordinary citizens of Cuba. This full-time schedule must also include educational activities that result in meaningful interaction in between U.S and Cuban nationals. The trip to Cuba must be escorted by an employee of the organization. Free time in excess or regular tourists' activities are not permitted. Request Your Complimentary Custom Private Tour & Quote Now! Just a US traveler looking to go to Cuba on people-to-people tours? Are you a US K-12 teacher, university or school professor? Check these tours! 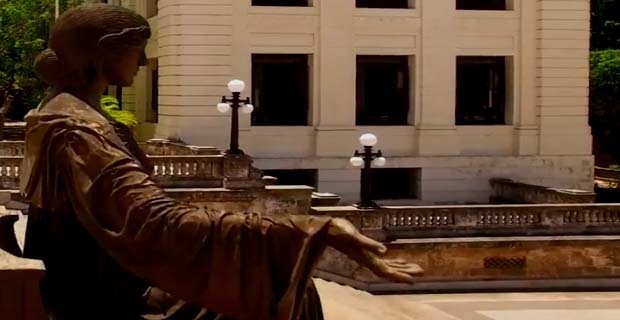 Guided architecture tour of Havana's Historic Center. Guided architecture tour of Santiago de Cuba's Historic Center. Guided architecture tour of Camaguey's Historic Center. Guided architecture tour of Bayamo's Historic Center. Guided architecture tour of Sancti Spiritus's Historic Center. Guided architecture tour of Cienfuegos's Historic Center. Guided architecture tour of Trinidad's Historic Center. 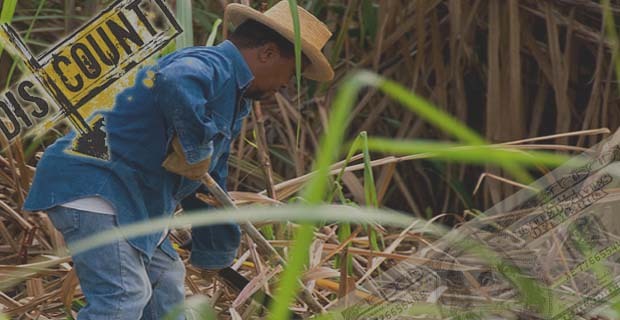 Travel to UNESCO World Heritage Site Sugar Mill Valley. Meet with architect Coyula at the Scale Model of Havana. Meet with architect Marin from UNESCO Cultural Department. Meet with architect Millan from Cienfuegos City Historian Office. Tour of Capitol building designed by Cuban architects. Visit to the Group for the Comprehensive Development of Havana. Tour of Catalina's House, Cuba's first art deco architecture house. Tour of architectural landmark Centro Asturiano (1927). US Architects, Urban Planners, Landscape Designers; Architecture Professors, Faculty and Students; and other Architecture Professionals from USA interested in conducting professional research on Cuba’s architectural heritage and historical preservation can travel to Cuba under the provisions of the General License for Professional Research. Non-architecture-professional citizens from USA interested in visiting Cuba to learn more about Cuba’s architectural heritage and historical preservation can travel to Cuba under the provisions of the General License for People-to-people Educational Group Travel issued by US organizations. This educational people-to-people group tour is sponsored by US organizations that are authorized by the US Treasury Department’s Office of Foreign Assets Control (OFAC) to run cultural and educational people-to-people programs to Cuba. Your People-to-People General License is already included in the price of the tour. Tourism to Cuba from US is still prohibited by the US Cuba travel regulations. In other words, American visitors to Cuba cannot simply book an all inclusive “sun & beach” vacation and relax in the crystal-clear Caribbean waters of Cuba while sipping in mojitos like Canadians and most citizens of the world can. Educational and cultural exchanges in between the Cubans and the American visitors must be included in the itineraries. During the Trump administration the General License for Professional Research and the General License for Group People-to-people Educational Travel to Cuba remain in place. 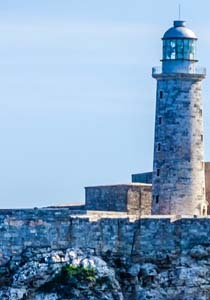 An architectural landmark of Havana, the Morro Castle was erected between 1589 and 1630 to protect the entrance to Habana harbour from pirates. Standing high on a rocky bluff above the Atlantic, the fort– with its irregular polygon shape, 10ft-thick walls and deep protective moat– is a classic example of Renaissance military Cuban architecture. The House of Catalina Laza, Havana's first art deco architecture construction, was built in 1926 by Juan Pedro Baro with marble from Carrara, ornaments from Lalique and sand from the Nile. Baro had it built for the beautiful Catalina Laza. Visit to the Cathedral Square, the most beautiful and private 18th century colonial plaza of Old Havana, named after the masterpiece of Cuban baroque architecture: the Cathedral of Havana built by the Jesuit order. An architectural landmark in Havana, the Bacardi building is one of the finest Art Deco builings in Cuba, and a jewel of Cuban architecture. The building was property of Don Emilo Bacardi founder of the Bacardi Imperium. 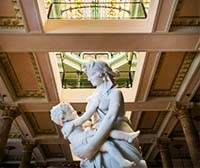 In the year 2001 the building was restored with its original decorations, beautiful marbles and Cuban Art Deco architectural style accessories. The Capitol Building, designed by Cuban Architects and built by the American construction company of Purdy & Henderson. This monumental building is one of Cuba’s most outstanding architectural patrimony packed with artwork from Cuban and foreign artists. The dome is 300.96 ft. high (7 inches higher than the highest capitol building in the US) and the recently renovated gardens are the work of the famous French Landscape Architect, Forestier. Cuba's architectural jewel, San Pedro de la Roca Morro Castle, a XVII century military construction atop the cliffs at the narrow entrance to Santiago de Cuba bay and one of the settings of the Spanish American War. The fortress was declared a World Heritage Site by UNESCO in 1997, cited as the best preserved and most complete example of Spanish- American military architecture. A landmark of Cuba's religious architecture, the Basilica de Nuestra Senora del Cobre is the country’s most sacred pilgrimage site since the Virgin of Charity is the patron saint of Cuba. In the Afro-Cuban religion she is associated with Ochun, the Yoruba goddess of love. Camaguey Historical Centre, declared UNESCO World Heritage Site in 2008 is a must in any architecture Cuba tour. Camaguey is the third largest city in Cuba, and the largest province in the country. It is one of the seven original settlements founded by Diego Velasquez. Trinidad is an outstanding example of Cuba's colonial architecture. It has maintained its historic core, featuring the highest percentage of surviving antique buildings and public squares and bringing together architectural, historic and cultural elements of great value. The Urban Historic Centre of Cienfuegos, a must in any architecture Cuba tour was inscribed by UNESCO in the World Heritage List, citing Cienfuegos as the best extant example of the 19th-century early Spanish Enlightenment implementation in urban planning. The downtown contains 6 buildings from 1819-50, 327 buildings from 1851-1900, and 1188 buildings from the 20th century. There is no other place in the Caribbean which contains such a remarkable architectural cluster of Neoclassical structures. This jewel of Cuba's architecture originated as a home for trader, Celestino Caceres, who later gave it as a wedding present to the Valle family who added to it (in a Mughal Style with carved floral motifs) a stunning Carrara marble staircase, cupped arches, bulbous domes and delicate arabesques. Day 1. Saturday 15 August 2020. Arrival at "Jose Marti" International Airport in Cuba's capital city. Welcome to Havana City, one of the most stunning architecturally designed cities in the world, with extraordinary variety and quality. Meet your Authentic Cuba Travel tour guide and bus driver. 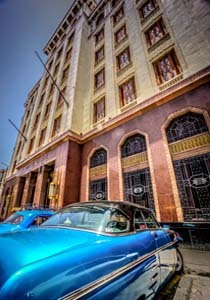 Private transfer to your hotel Tryp Habana Libre located at the cultural center of Havana City. In the 40s and 50s, many high-rise buildings and apartment complexes helped dramatically alter the skyline of Havana City. Your hotel Habana Libre (1958), which before the Revolution was the Havana Hilton Hotel and nearby La Rampa Movie Theatre (1955) are good examples of this important architectural period. Breakfast is complimentary from 7:00 a.m. to 10:00 a.m.
Day 2. Sunday 16 August 2020. Morning: meeting with our guide for the morning, architect Miguel Coyula from the Group for the Comprehensive Development of Havana City at their headquarters in The Scale Model of Havana City, a museum that contains a model of the entire city of Havana. The model took nine years to build and is the second largest in the world after one of New York. Havana's 727 square kilometers are represented in an area of 22 meters of length and 10 meters of width. City planners needed to see and have a tactile sense of the impressive physical and cultural patrimony of Havana, spanning five centuries as a port city, island Caribbean capitol, and launching pad for the conquest of the Americas. Guided panoramic motor coach tour of Modern Havana. We will visit places like Square of Revolution, University of Havana, Seawall, Vedado Neighbourhood, 1830 Restaurant, Miramar neighbourhood, Nacional Hotel of Cuba, Cemetery Colon, and others. The House of Catalina Laza, Havana's first art deco house, was built in 1926 by Juan Pedro Baro with marble from Carrara, ornaments from Lalique and sand from the Nile. Baro had it built for the beautiful Catalina Laza. America Building is a theatre complex designed in 1941 by architects Fernando Martinez Campos and Pascual de Rojas, consisting of two theatres, a restaurant and some shops in the main floor and residential apartments in the upper floors. Its interiors are very well preserved and conserve all the details of the original monumental design. Lopez Serrano Building, with its strong reminiscence of American Skyscrapers, resembling a miniature Empire State Building with the bottom 70 floors chopped off, the López Serrano building is Vedado’s most distinctive art deco architecture example. It was built in 1932 by Mira & Roisch Architecture Firm, it was the highest residential building in Havana for many years. Lunch at La Mina restaurant. Afternoon: guided walking tour of Old Havana, UNESCO World Heritage Site. Palacio de los Capitanes Generales was the former seat of colonial government. Today the building houses the Museum of the City. Palacio del Segundo Cabo, the seat of the second authority of the island. Today it houses important publishing concerns. Castillo de la Real Fuerza. The second oldest fortress built by the Spaniards in the West Indies, a good example of early Cuban architecture. Notice the influence from different architectural styles, with a diverse range of Moorish, Spanish, Italian, Greek and Roman architecture. Visit to the Cathedral Square, the most beautiful and private 18th century colonial plaza of Cuba, named after the masterpiece of Cuban baroque architecture: the Cathedral of Havana built by the Jesuit order. Continue walking tour onto San Francisco Square, one of the oldest in the historical quarter. Visit to Plaza Vieja, the only civic square of colonial times. Notice it doesn't have a church or government building around. Here we will visit important institutions for visual arts. Free time in the famous handicraft market of Old Havana, located inside the Almacenes de Depósito San José, an old warehouse on the harbourside where you can purchase all sorts of crafts and souvenirs by local artisans. Evening: Enjoy performance of the National Ballet of Cuba or the Spanish Ballet of Cuba at the Great Theatre of Havana (optional) (TBC). Day 3. Monday 17 August 2020. Visit to the Capitolio Nacional, designed by Cuban Architects and built by the American construction company of Purdy & Henderson. This monumental building is one of Cuba’s most outstanding architectural patrimony packed with artwork from Cuban and foreign artists. The dome is 300.96 ft. high (7 inches higher than the highest capitol building in the US) and the recently renovated gardens are the work of the famous French Landscape architect, Forestier. Centro Asturiano, inaugurated in 1927 designed by Spanish Architect Manuel del Busto features solid heavy façades constructed in Capellania Stones with clear influence of Spanish Renaissance. It houses the most majestic staircase of Cuban Architecture. Since 2001 the building houses the new Museum of Fine Arts. Manzana de Gomez, first entire city block built in Cuba in the beginnings of the 20th century completely for commercial use with two inner diagonal streets that cross the building in all directions integrating the pedestrian circulation with the outer fabric. Visit to the former Centro Gallego, an exponent of German neo-baroque architecture style in Havana, built in 1915 by Belgian architect Paul Belau. The building is adorned with stone and marble statues. There are also sculptural pieces by Giuseppe Moretti depicting benevolence, education, music and theatre. It was not until 1985, and as initiative of the prima ballerina Alicia Alonso that the building was renamed and became the Great Theatre of Havana. Bacardi Building, designed in 1930 by Cuban architects Esteban Rodriguez Castells, Rafael Fernandez Ruenes and Jose Menendez Menendez, located in Las Murallas district. The rich façade design is based on polychrome granite imported from Bavaria and Norway as well as coloured brick, terracotta and Capellania stone. The elaborate decoration of the building crown features a bat, logo of the Bacardi company. Visit the rooftop of the Sevilla Hotel for an eagle view of the walk you have taken in the morning while enjoying a refreshing Mojito cocktail. Lunch at Hotel Sevilla’s Rooftop restaurant. Walking tour along the Paseo del Prado, a pedestrian promenade remodelled in 1929 with the inauguration of Havana’s Capitol Building. Visit to residential buildings along the boulevard with clear influence from European and American architecture. Visit to the interior of the most important residence: Cuba’s former president Jose Miguel Gomez Residence. Visit to the former Asociacion de Dependientes del Comercio, a Venitian neo-renaissance style building placed in a key corner of the Prado featured in the film Buena Vista Social Club. Visit to the former Casino Español, currently used for wedding ceremonies for its lavish interiors. Evening: tonight we have a Cuban band playing for us! 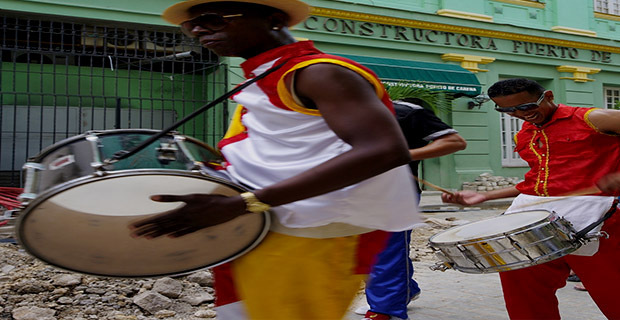 You'll learn to dance to Salsa, Son, Rumba, and other popular Cuban rhythms with instruction from bandleaders. Day 4. Tuesday 18 August 2020. Morning: flight to Santiago de Cuba. Estimated flight time: 2 hours. After arrival visit to San Pedro de la Roca Morro Castle, a XVII century military construction atop the cliffs at the narrow entrance to Santiago Bay and one of the settings of the Spanish American War. The fortress was declared a World Heritage Site by UNESCO in 1997, cited as the best preserved and most complete example of Spanish-American military architecture. Santiago de Cuba is the former capital of the country and the second largest city in Cuba. Founded by Diego Velazquez in 1514, the city was built on the east side of the bay. This was the starting point of the expeditions led by Juan de Grijalba and Hernán Cortés to the coasts of Mexico in 1518, and in 1538 by Hernando de Soto's expedition to Florida. The first cathedral was built in the city in 1528. From 1522 until 1589 Santiago was the capital of the Spanish colony of Cuba. The city experienced an influx of French immigrants in the late 18th century and early 19th century, many coming from Haiti after the Haitian slave revolt of 1791. This added to the city's eclectic cultural mix, already rich with Spanish and African culture. Lunch at El Morro Restaurant. Afternoon: panoramic bus ride of modern Santiago de Cuba. We will visit the Heredia Theatre, San Juan Hill, Square of Revolution Antonio Maceo, baseball stadium Saturnino Lora, Moncada Barracks, Palacio de Justicia, among others. Check in at Melia Santiago (breakfast and dinner included). Evening: enjoy traditional local music at Casa de la Trova. Day 5. Wednesday 19 August 2020. The Cathedral, originally built in 1522 and where the remains of Diego Velasquez are buried. Ayuntamiento (City Hall) erected in 1950’s. From the balcony of this building Fidel Castro gave his victory speech immediately after the success of the Revolution on January 1rst, 1959. Visit the oldest house in Cuba, today Museo de Ambiente Historico Colonial and formerly the residence of Diego Velázquez in the XVI century. Lunch at the rooftop of Casagranda Hotel. Day 6. Thursday 20 August 2020. Morning: departure to Bayamo, the second of the seven cities founded by Diego Velázquez de Cuéllar. It was established on November 5, 1513. During much of the 16th century it was one of the most important agricultural and commercial settlements of the island. Its inland situation gave it relative security against the pirates who then infested West Indian seas, and the misfortunes of Santiago were the fortunes of Bayamo. Bayamo was the stronghold of early revolutionary Carlos Manuel de Céspedes, who freed his slaves and declared war against colonialist Spain. During the ensuing battles, Bayamo exchanged hands several times and was once burned to the ground by Cuban rebels as the city was being sacked by the Spanish. Visit to Bayamo’s Historical Center. Visit Casa Natal Carlos Manuel de Céspedes, the birthplace of the "father of the Cuban nation," is the only house on the square that escaped destruction from the fire. Visit to Bayamo’s Cathedral. It dates back to the 16th century. It reflects the ethnic style of baroque architecture. Some of the traditional painting masterpieces of Cuba are also found in it. It portrays a battle mural with a flag of the Cuban revolution hoisted on the top. Lunch at Sierra Maestra Hotel. Afternoon: continue on bus ride to Camaguey city. Late afternoon check in at Colon hotel. Dinner at hotel. Evening: participation in the different cultural and policical venues taking place in the historical center around New Years Eve. Your guide will give you options the days before so that you plan ahead this day or just play as it goes! Day 7. Friday 21 August 2020. Morning: guided walking tour of Camaguey Historical Center, declared UNESCO World Heritage Site in 2008. Camaguey is the third largest city in Cuba, and the largest province in the country. It is one of the seven original settlements founded by Diego Velasquez. The old city layout resembles a real maze, with narrow, short streets always turning in a direction or another. After Henry Morgan burned the city in the 17th century, it was designed like a maze so attackers would find it hard to move around inside the city. We will explore Parque Agramonte named after local hero, the Cathedral, originally established in 1530 and other interesting historical sites of the city such as Plaza San Juan de Dios, dominated by the church of the same name. Afternoon: free to explore the city on your own. Day 8. Saturday 22 August 2020. Morning: departure to Sancti Spiritus city, one of the first seven settlements founded by Diego Velázquez de Cuéllar in 1514. The Parroquial Mayor is located two blocks south of the town's main square; it is a venerable green towered church whose early 16th-century origins make it the country's oldest. The Museo de Arte Colonial (Colonial Art Museum), perhaps Sancti Spíritus's most splendid colonial home is the city's standout attraction. The opulent former palatial mansion of one of Cuba's most elite families, the Valle Iznaga clan, who fled Cuba after Fidel's Revolution, it became the property of the state in 1961. Ninety percent of what you see inside, from furniture to paintings, is original. Though the family obviously kept an impressive collection of Limoges porcelain, French gilded mirrors, Italian marble tables, and Baccarat crystal chandeliers here, it wasn't their primary residence; the house was used mostly to host family members in transit, so the furnishings were rather eclectic. Another interesting architectural landmark in this city is one of Cuba's oldest bridges, over Yayabo river. Built in 1815 with clay bricks it forms 5 arcs being the center one 9 meters tall. The entire bridge is only 85 meters long and was designed for pedestrians and carriages during Colonial Cuba but has resisted modern heavier traffic so far. Lunch on your own on the historical center. Afternoon: after lunch we continue bus ride to Trinidad and check in at all-inclusive Trinidad del Mar Beach Resort. You'll have time for dinner and a swim in the warm waters of the Caribbean Sea. Day 9. Sunday 23 August 2020. Morning: guided by City Historian, we will take a walking tour of UNESCO World Heritage Site, Trinidad’s Historical Center, a perfect relic of the early days of the Spanish colony with beautifully preserved streets and buildings with hardly a trace of the 20th century anywhere. Visit to the Architecture Museum (Casa de los Sanchez Iznaga), housing the most representative samples of the city's architectural development in the 18th and 19th centuries. Visit to Museo Lucha contra Bandidos, former home of the San Francisco de Asis convent. Visit to Museo Romantico, overlooking the Trinidad main square. It has an excellent exhibition of romantic style porcelain, glass, paintings and decorative furniture which belonged to the Conde de Brunet and other Trinidad notorious families. We will stop at a mirador (lookout) over the Sugar Mill Valley, where the sugar barons used to have their countryside mansions and mills. This site is an UNESCO World Heritage Site. Trinidad is well known for its pottery makers. We meet with a family that has been passing the tradition for generations: the Santanders. Free time to wander the streets of historical centre or enjoy the beach. Evening is free to enjoy the beach, hotel amenities, and the lively streets of Trinidad. How about live Cuban popular music on steps of Casa de la Música – a great opportunity to dance with Cubans and your tour companions. Day 10. Monday 24 August 2019. Day is free to enjoy the beach, hotel amenities, and the lively streets of Trinidad. Day 11. Tuesday 25 August 2020. Morning departure to Cienfuegos, a city of neoclassical buildings with a European flair. Guided by Cienfuegos City Historian, architect Iran Millan Cuetara, we will embark on a walking tour of Cienfuegos Historical Center. The Tomas Terry Theatre, completed in 1895 and named after a sugar baron from Venezuela who arrived in Cuba with no money and made his fortune by buying sick slaves for a low price, to later nurse them back to health and reselling them. This money was invested in a sugar estate that brought him the wealth to build several outstanding buildings in Cienfuegos, including this theatre, with materials specially brought over from Europe. The Casa de la Cultura, home of another wealthy sugar baron, stunning mansion in neoclassical style. The Cathedral built with the donation of wealthy families like the Lebrancs, the Albis, the Terrys. Inside you find the reproductions of the 12 Apostles in stained glass imported from Paris. Also the original machinery of the clock tower was built in France. Still in place and working. We'll also visit the elegant art gallery Galería de Arte Maroya and review its impressively displayed collection of paintings, sculptures and antiques. Followed by visit to Palacio de Valle upon arrival. This architectural jewel originated as a home for trader, Celestino Caceres, who later gave it as a wedding present to the Valle family who added to it (in a Mughal Style with carved floral motifs) a stunning Carrara marble staircase, cupped arches, bulbous domes and delicate arabesques. Lunch at Palacio del Valle restaurant. Afternoon: continue on bus ride to Havana. Check in at Habana Libre Hotel. Check out of hotel to Havana City International Airport. National Art Schools, designed and built by architects Cuban Ricardo Porro and the Italians Roberto Gottardi and Vittorio Garatti. Lopez Serrano Building, built in 1932 by Mira & Roisch Architecture Firm, it was the highest residential building in Havana for many years. The House of Catalina Laza, Havana's first art deco house, built in 1926 with marble from Carrara and ornaments from lalique. Centro Asturiano, designed by Spanish Architect Manuel del Busto in 1927. It houses the most majestic staircase of Cuban Architecture. America Building, a theatre complex designed in 1941 by architects Fernando Martinez Campos and Pascual de Rojas. Visit to the Capitol building, designed by Cuban Architects and built by American Purdy & Henderson. The gardens are the work of the French Landscape Architect, Forestier. Visit to the former Centro Gallego, built in 1915 by Belgia Architect Paul Belau. Bacardi Building, designed in 1930 by Cuban Architects Esteban Rodriguez Castells, Rafael Fernandez Ruenes and Jose Menendez Menendez.